Attending the Colorado Sewing Rebellion workshop last weekend made me realize — I’m happier when I devote some time to my inner creator. That feeling you get from sitting down, using your creative mind and your hands to make is known to boost mental well-being even after you have put away the art supplies. So, here are a few classes and workshops happening in the Boulder area over the next month for you to schedule in some much-deserved creative self-care time and make something fun! Bohemia is offering a class in Mixed Media Furniture, where you can bring in a drab table, chair or other wood piece of furniture and transform it into something beautiful! You bring the chair, Bohemia provides all other materials, as well as snacks and excellent company. This workshop will be held on Tuesday, February 26 & March 5, 2019 from 6 PM – 9 PM. Course fee of $100 includes both sessions. Register here. 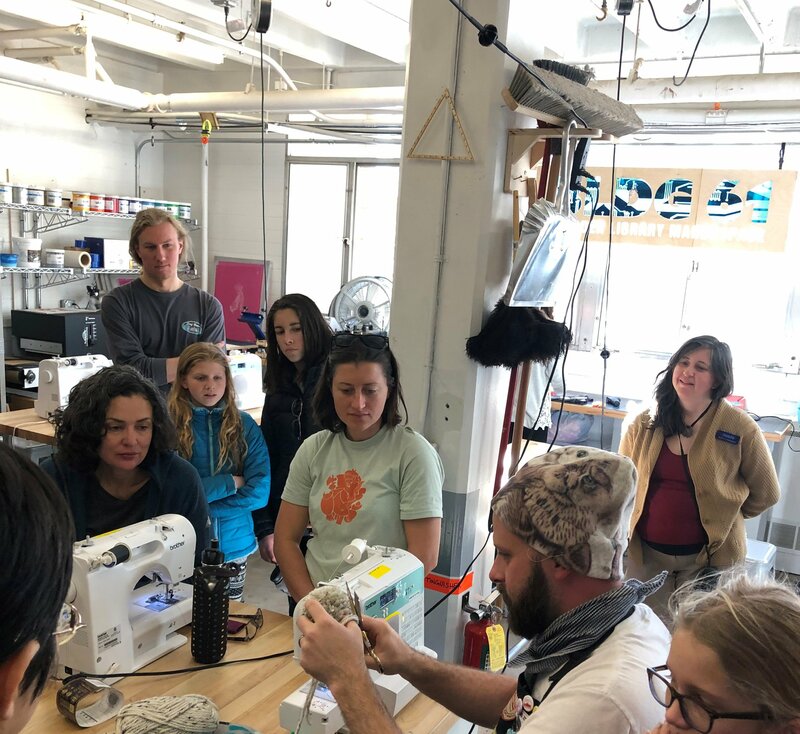 Sewing Rebellion Boulder will be held once again at the Main Boulder Public Library’s BLDG 61 Makerspace, hosted by Faux Frau Steven Frost on Sunday, March 3, 2019 from 2:30 PM – 5:30 PM. Different repurposing project instructions are provided each month, and/or come by with your own sewing/altering projects to work on. Last time, Steven showed us how to make a warm & wonderful winter hat complete with pom poms! Sewing machines and sewing tips provided. No prior sewing experience required to participate. Drop-ins welcome. FREE to attend! Donations graciously accepted, but not required. Sewing Rebellion is organized by the Institute 4 Labor Generosity Workers & Uniforms (ILGWU), the governing entity and experimental factory that houses the ongoing and archived projects of Frau Fiber, former textile worker, activist and symbol of the lost generation of East German workers. Open Hands Art Studio opens its doors each week so you can explore your ideas in a supportive and relaxed environment with access to both the painting/mixed media studio and the clay studio. Sue and Page are there to help you brainstorm, develop your ideas and technique, and support your process. Our goal is to encourage community, creativity and collaboration. No experience is required – just a willingness to give it a try! We use a punch card system – come when you can! Guided Open Studio is held every Tuesday from 9:00 AM – 12:00 PM with the September-April art show on May 7th. For more info, click here. Learn how to make a detailed image using a felting needle at pARTicular’s Felt Painting Workshop. You will design your piece on a pre-felted wool square that can be turned into a beautiful wall hanging. Needle and wet felting techniques will be demonstrated for enhancing your piece. Each student will make their own wet-felted background piece to take home to use for a second felt painting. For more info, click here. The Felt Painting Workshop on Sunday, March 10, 2019 from 12 PM – 3:30 PM. Tuition for the class is $45. Register here. A class is for the brand new knitter, you will practice the basic stitches as well as learn a few finishing techniques by creating fingerless gloves or a ribbed scarf. You’ll learn: Cast on, bind off, knit and purl, garter stitch, stockinette stitch, ribbing and mattress-stitch seaming. This class costs $50 and is held on March 12, 19 & 26, 2019, register here. Interested in learning more about fiber arts? There are a ton of classes teaching everything from crocheting to felting to weaving for all skill levels at the Longmont Yarn Shoppe.